This is the fall. This is the beginning of the next arc. And this is the resurgence of Rasputin. Though there are some loose historical facts involving the plot, the mystical powers and the world travels are somewhat fictional. The first arc saw his rise to infamy and subsequent crash but this next sees his story dramatised even more than his actual legacy. This image is engrossing because of what you don’t see, the haunting of Rasputin as he whiles his hour with a bottle of alcohol. At least you would like to think it is because he looks homeless in rags and keeps loose papers for refuge but the bottle is red together with it’s spillage. It is clearly purposefully meant to look like blood representing the regrettable acts he has performed and his inability to cleanse himself. Rasputin sits there startled and looks up quizzically as if to ask, who is out there? The ever so subtle white outlines and eyes appear ghostly, but there are his travelling companions and he carries them with him even though he seems to have forgotten they are there. 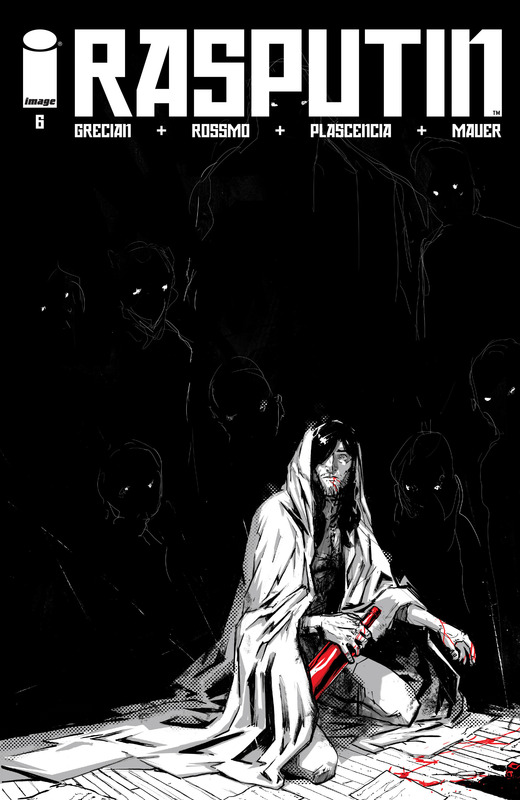 Rasputin is consumed with guilt, wrapped in a bottle of alcohol and haunted by his past. Rossmo cleverly uses the space on the page and grayscale colour with a dash of red to clearly convey this. This is Rasputin at his lowest and his isolation is expressed so vibrantly but we all know this will not be for long, as you can’t keep a good man down for long. Previous PostThe Theatre List 17/6 – Bringing back the Underground! Next PostThe Theatre List 24/6 – Awash in confusion!